Faculty members of the Eck Institute for Global Health have placed three recent doctoral recipients at the United States’ National Institute for Health (NIH). Having received offers for these prestigious global research-training opportunities, the trio is now in Maryland. Coming from the laboratory of Associate Professor Michael Ferdig, Department of Biological Sciences, and Eck Institute for Global Health member, is Becky Miller, ’12 PhD. Ferdig’s research lab is known for addressing multidrug resistant malaria. Miller now joins the National Institute of Allergy and Infectious Diseases (NIAID) as a postdoctoral fellow receiving the prestigious NIH Intramural Research Training Award (IRTA). She will work in the Laboratory of Malaria and Vector Research under Rick M. Fairhurst, PhD, Chief of the Malaria Pathogenesis and Human Immunology Unit, and Jennifer Anderson, PhD. Miller’s doctoral program of studies under Ferdig included an interdisciplinary training fellowship in the Global Linkages of Biology, the Environment, and Society (GLOBES) program made possible by a National Science Foundation Integrated Graduate Education and Research Traineeship (IGERT) award. Miller’s dissertation research shed light on the genetics and genomics of the parasite that causes malaria, allowing for greater insights into drug resistance and virulence of the parasite, and for more informed control decisions. Her approach also looked at the economic, social, and political influences that play key roles in combating malaria. Miller was part of a team that developed a gene chip capable of recognizing differences in DNA sequence at thousands of places in the malaria parasite genome. She worked to analyze parasite DNA from hundreds of patients with malaria in southeast Asia and mapped a genetic region that controls this emerging resistance of Artemisinin. This locus can be valuable as a genetic marker to identify patients with malaria strains that will not respond and will lead to follow-up studies to identify the mechanism of drug resistance. Brandy St. Laurent, another GLOBES-IGERT fellow and recent PhD graduate in Biological Sciences, studied under internationally known genetics researcher Frank Collins, PhD, the George and Winifred Clark Professor of Biological Sciences. St. Laurent is also a recipient of the prestigious NIH Intramural Research Training Award and joins colleague Becky Miller at the Rockville campus. Her research experiences while studying at Notre Dame allowed for unique international opportunities at field sites in Indonesia and parts of Western Africa. In Collins’ lab, with funding from the Bill and Melinda Gates Foundation via the Malaria Transmission Consortium (MTC) and NSF-IGERT training award, St. Laurent travelled extensively to acquire best trapping techniques for mosquito capture and to test mosquito behavior in their natural environment with local partners. This extraordinary field experience working with international collaborators gave St. Laurent the appropriate preparation for fieldwork at the global research level. Working in the laboratory of Assistant Professor Molly Duman Scheel, PhD, from the Indiana University School of Medicine, South Bend, is Ellen Flannery, PhD. Flannery also received a prestigious offer at NIH, which will move her back into her original area and interest in developmental neurobiology. She will be located at the Bethesda campus. She has greatly benefited from her experience and unique opportunity to work in developmental and vector research under advisor Molly Duman Scheel. Duman Scheel is a member of the Eck Institute of Global Health and holds a dual faculty appointment at both Notre Dame and Indiana University Medical School, South Bend. Her own research interests include genetic and comparative analysis of invasive cellular growth with emphasis on understanding axon growth and guidance for implications in cancer biology, regenerative medicine, and vector biology. Flannery is taking her research to the next level by combining both her work in developmental biology and model systems for comparative approaches. As a recipient of an Eck Institute for Global Health Fellowship, Flannery was able to explore olfactory reliance comparing Aedes aegypti, Anopheles gambiae, and Drosophila Melanogaster. Flannery will be in the National Institute of Neurological Disorders and Stroke (NINDS) of NIH in the laboratory of Susan Wray, PhD. Miller and St. Laurent will work in tandem for the next two to three years under the leadership of fellow Notre Dame alumnus Bob Gwadz, ND ’62, PhD ’70, who serves the NIH as Chief of the International Studies of Malaria and Entomology Section of the NIAID. While their work will fall under the basic project, they will develop a research program of their own design within the general framework of mosquitoes and malaria. Miller will spend most of her time in the lab working on parasites and St. Laurent will spend four months or more a year in Cambodia with an opportunity to also work in Mali. Their work will focus on research being conducted in Cambodia where NIH has a program based at the National Malaria Center in Phnom Penh and will soon coordinate with the National School of Medicine. Field labs have been set up in satellite areas of Cambodia including Preah Vihar and Ratananakiri near the Laos and Vietnam borders. The primary focus of NIH research to date has been on the genesis and spread of artemesinin ‘resistant’ in Plasmodium falciparum. This new look at an old problem from a focus on the Thai Cambodian border in the west will lend new insights into the challenge of control of malaria. 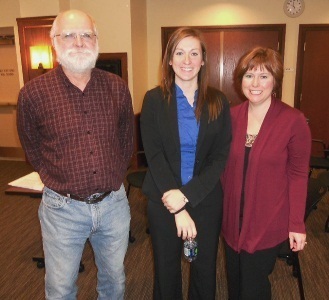 In the photo (L-R) David Severson, Ph.D., Ellen Flannery, Ph.D., and Molly Duman Scheel, Ph.D. Originally published by Sarah Craig at science.nd.edu on November 28, 2012.